Place the cream, Grand Marnier, ginger, cardamom and cinnamon sticks in a saucepan and bring to boil. Once boiled, place the cream mixture in a jug and refrigerate. The next day, reheat the cream in a saucepan and bring to the boil. Once boiled, add the orange zest and set aside for about 5 minutes. After 5 minutes, strain the cream mixture. Pour the egg yolks into a large mixing bowl and whisk together, adding the sugar and whisking until thoroughly combined. Pour the cream mixture into the egg mixture and whisk through. Bring a pot of water to the simmer, making sure it is large enough to hold ¾ of the bowl on top of the pot. Place the bowl on top of the pot and using a temperature resistant rubber spatula, stir the egg and cream mixture. Cook on this double boiler for about 12-15 minutes or until the mixture is thick, with no lumps. Use the spatula to scrape the sides of the bowl. Do not allow the bowl to touch the water, as it will overcook the egg. Once the custard is thick and smooth, remove from the heat and whisk for a couple of minutes to cool (over ice water if necessary). Refrigerate overnight. 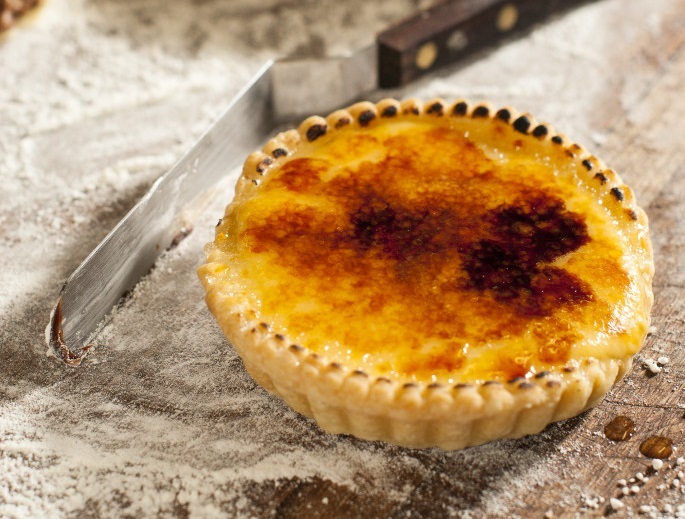 Place the custard into a piping bag and pipe into the tart shells. Sprinkle evenly with caster sugar then brûlée with a culinary torch until golden.